Erivum Puliyum: Moongdal Laddus ~ Celebrating EP's 500th Post !!! Crossed 500 posts ?? Well,Its still a dream come true for me.Am happy that I could experiment many recipes out of which 500 made its way to showcase in my space and was shared with all of you.All this was possible with the continuous support of my blogger friends,family members and my close friends who showered comments and have inspired me to cook more.I would also like to thank each of you who have liked my page in facebook,shared my recipes on facebook too.It indeed means a lot to me,flying high.As usual all good things in life is celebrated with sweets and so here comes another tempting laddus-moongdal laddus.This is a very simple recipe if you have roasted moongdal flour in hand or else can try making this from scratch,not a much difficult task as I prepared mine from scratch.Try & enjoy !! Heat a pan and dry roast moong dal over medium flame until you get a nice aroma and golden color,it takes around 2-3 mins.Let it cool and then powder it to a smooth powder using blender.Sieve it once if required to get the soft flour of moong dal.This flour can be kept in handy( refrigerated) for 3-4 months,you can then mix sugar and ghee to make these yummy laddus. -Powder the sugar in a blender until smooth along with cardamom seeds if using(else use cardamom powder ).Mix together sugar powder and roasted moong dal flour blend again for a minute.Check for the sweetness now if you wish a more sweeter version add 1-2 tbsp extra sugar powder,mix well again. -Heat ghee in a non stick pan or kadai and fry the chopped almonds and cashew nuts until it turns slightly browned. -Add moong dal flour and sugar mixture to it and switch off the flame.Mix it properly until the ghee is coated properly.Let the mixture cool down to leuk warm to shape into balls.Shape the mixture in your palms in round shapes,use drops of ghee in your palm if you find it hard to shape the balls.Press it hard to make tight balls as possible otherwise it may break. -Serve or let it cool completely before storing in air tight containers if you have any left overs. * Powdered sugar /confectioner's sugar may not work good as it contains corn starch in it. 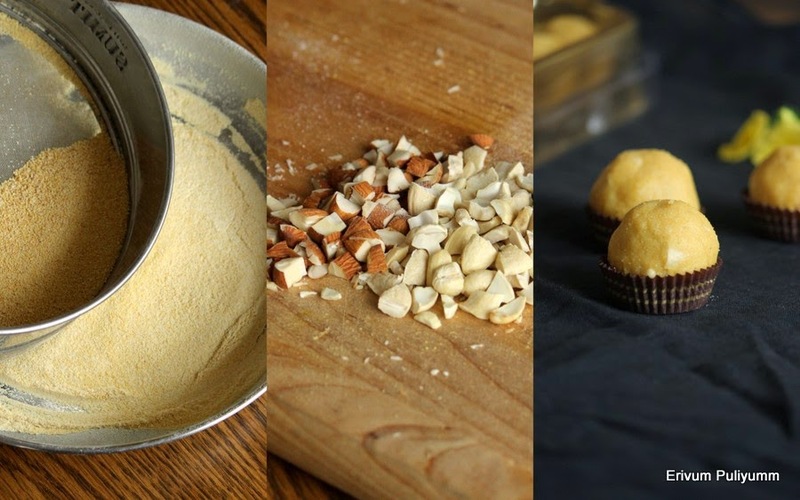 * I have added coarsely chopped nuts which adds a nice crunch in these laddus.But you can always add finely chopped nuts as in original recipe. congrats julie, ladoos look absolutely yumm..
Congrats dear. Way to go...these Ladoos look awesome..I wish I could taste them..
Congratulations on your 500th post dear. Mouth watering yummy laddus. Very nice clicks and neat presentation..loving it. My daughters fav dessert...... Looks rich and yumm!! 500 WOW! Great post for celebration!! Nice recipe Julie..and congrats on the milestone! Congrats Dear :) Laddus looks very delicious and yum yum..
Congrats Julie..Lovely and yummy laddus.. These mung bean balls look fingerlickingly delicious! Congrats Julie, yummy ladoos and beautiful clicks..
congrats dear n superb presentation!!! congratulations Julie and wishing you many more to come, love the ladoos. Wow look at those perfect shaped yellow ladoos!!! I don't think I ever tasted these, may be in my childhood days...don't remember. But I really love to try these. Congrats Julie,way to go gal..Laddoos looks absolutely delicious and prefect for celebration. Congrats! Juile wish you many many more milestones.These ladoos look so yum.